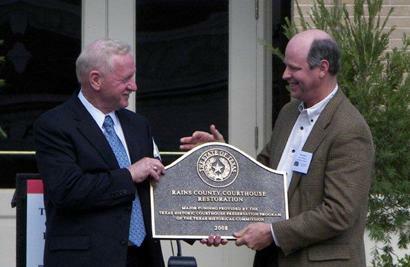 Rededication of the 1908 Rains County Courthouse. On April 2, 1909, the county commissioners of Rains County accepted their newly completed courthouse. Over 100 years later, the courthouse has now been restored to its original condition as part of the Texas Historical Commission’s Texas Historic Courthouse Preservation Program. According to a press release from the THC, Rains County received a total of $2.44 million in grant money towards the courthouse’s restoration, $1.95 million of which was provided in during Round IV of the program in May of 2004. 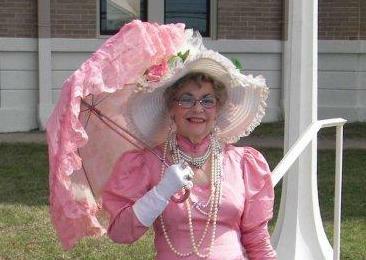 The centennial celebration and rededication ceremony for the courthouse was held on October 17, 2009 with hundreds of county residents and visitors enjoying early 20th century musical numbers from banjo, guitar and fiddle players and singers from the Rains County community choir. 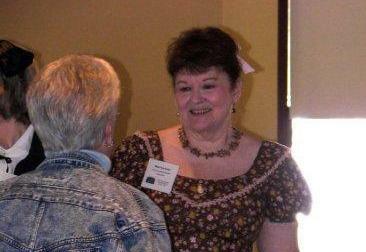 Many long time residents were on hand to recount stories from the early days of Rains County while others took part in a game of dominoes under a tree at the northeast corner of the building. 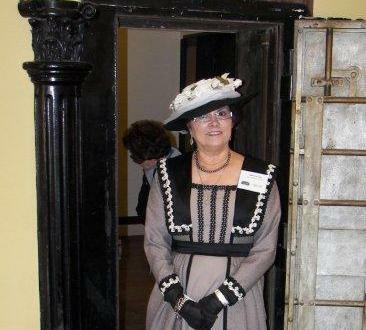 Courthouse tours beginning at 10:00AM were conducted by members of the Rains County Historical Commission, dressed in the attire of the time period that the courthouse was built. At noon, barbecue sandwiches were served under a tent north of the square and there were several booths with items for sale, including a Christmas ornament depicting the restored courthouse. 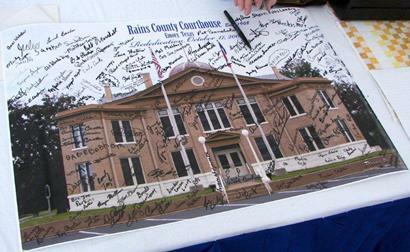 A blown-up photo of the courthouse was also available for every attendee to sign. The rededication ceremony began at 1:00 PM with county officials and members of the Texas Historical Commission seated on either side of a podium at the southwest entrance. Some of the distinguished guests included U.S. Congressman Ralph Hall and State Senator Robert Deuell, who participated in the presentation of new U.S. and Texas flags to be flown at the courthouse which were raised by a local boy scout troop. After the singing of the national anthem and state song, County Judge Joe Dougherty took to the podium to address the crowd. Afterwards, Stan Graves, Director of Architecture for the THC, presented Judge Dougherty with the courthouse’s restoration plaque, which was followed by the rededication of the cornerstone by the Grand Lodge of Texas Ancient Free & Accepted Masons. The cool and sunny weather provided a great backdrop for the occasion and everyone seemed to be enjoying themselves, myself included. I got the feeling that a majority of the people there were very pleased with the restoration efforts, as I kept overhearing people comment “it sure looks better than it used to.” This was the first Texas courthouse rededication that I attended and everyone I met during my visit was very welcoming. The pride that the people of Emory displayed for their courthouse that morning was infectious and I was glad to be able to be a part of it.